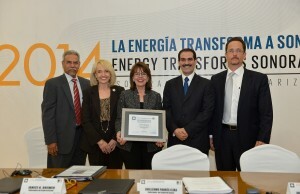 During the “Energy Transforms Sonora and Arizona” plenary session of the 55th Sonora – Arizona Commission, held last week in Hermosillo, Governors Guillermo Padrés of Sonora and Janice K. Brewer of Arizona signed two important health agreements and addressed strategies to replicate renewable energy parks in Sonora based upon existing ones in Arizona. The two health agreements include one to facilitate the passage of specimens across the border to assist with timely diagnosis of illnesses, and another to create a joint campaign to help with the prevention of addictions and drug abuse. Governor Padrés stressed the states of Sonora and Arizona have consolidated themselves as a single region that, based on hard work, have marked a difference with other border zones. Countries such as Israel, South Korea, and the U.S. itself, he added, have their sights set on the region given its geographic, competitive, technological and industrial advantages of both states. “We have all the elements within our reach for Sonora, as well as Arizona, to enter into a new industrial, technological revolution and we are ready to do so,” he commented. For her part, Governor Brewer acknowledged the importance of Mexico and Sonora to Arizona’s economy, as well as the importance of a bilateral relationship with strategies and beneficial programs for the two states. Both Governors emphasized the potential of the Global Advantage project, which was presented at the meeting and consists of collaboration between Arizona State University and the Off Shore Group, for the creation of thousands of companies and job positions through the technological advances of Arizona and the industrial capacity of Sonora. This year the “Álvaro Obregón” Award was presented to Margie Emmermann, Executive Director of the Arizona Mexico Commission, for her support in developing a more productive relationship and strengthening of friendship ties between the two states. Construction of new quarantine stables in San Luis Río Colorado. Review of implementation of structural reforms in fiscal and energy matters and impact on both sides of the border. Review of functional operation of real estate processes on both sides of the border. Promotion of events such as Engine Forum Sonora and design of strategies to promote work exchanges. Renewal of understanding agreement for monitoring of residual water in both states. Conferences concerning better use and care of water. Conferences at schools in Arizona regarding efforts in Sonora to get water to Hermosillo. Facilitating validation of documents for integration of students from Arizona to Sonora and vice versa. Mutual recognition of education of architects and civil engineers, with the potential to expand to other professions. Commitment to strengthen common strategies to develop and train teachers in both states. Strengthening of joint efforts in special education and to combat “bullying”. Analysis of electricity sector of Sonora and Arizona. Progress report on Sonora Gasoducto. Presentation of renewable energy projects to business and academic sectors of Sonora. Installation of board to review follow up of recommendations and draw up outlines for 2014. Present training courses and programs of mutual benefit. Exchange information on crime prevention. Identification course on false documents. Advanced course on high risk stops and tactical operations. Course on criminal activity and gangs. Strategy to decrease mortality and injuries to minors due to car accidents. Training courses by Arizona to staff of Accident Prevention Program of Sonora. Donation of children’s seats by Arizona. Good will agreement to carry out joint campaign for the prevention of addictions and drug abuse. Facilitate the passage of medical samples between states in order to treat illnesses. Report on construction of Puerto Peñasco Home Port and its impact on both states. Promotion of wine route, which will soon have first harvest in Cananea. Establishment of basis for the first historical-cultural route between the United States and Mexico.